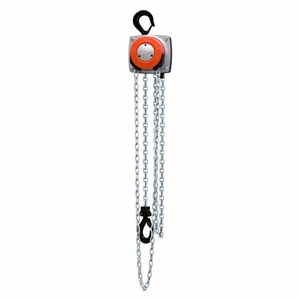 For the ultimate flexibility in a hand chain hoist, the CM Hurricane 360º is the choice for a wide range of applications. The patented hand chain cover rotates a full 360º to allow loads to be lifted, pulled, or positioned from virtually any angle. These hoists meets ASME B30.16 and European CE standard. A load limiter is standard for automatic overload protection. Braking power is reliable thanks to a Weston-type braking system that provides reliable, positive load control. The hoist casing comes with a powder coated finish for corrosion protection. Durable, heat-treated steel gearing--internal gears & pinions--for high strength and long life. A precision 4-Pocket liftwheel is fully machined for better chain fit and reduced wear allowing for accurate movement of the load chain. The load chain itself is made from hardened steel to ensure strength and long wear life. Maintenance is minimal--the hoist is easily disassembled and no special tools are required. To top it off, CM offers a 5-Year warranty against defects in materials and workmanship.